>Homemade yogurt in a family size pot! Love the flower shaped pot! Warm the milk to 50°C – check with a jam thermometer if possible or just the back of your hand: warm but not burning! Leave it for 5 min. then take it off the hob to add the other ingredients. I use the yogurt pot to measure everything else for ease. Add the powdered milk, the sugar and flavouring and put it back on the hob for 4 to 5 minutes until all is dissolved. Do not let it go too hot. Add the live yogurt and whisk briskly. Pour into individual glass pots or jam jars or a large glass container as here. 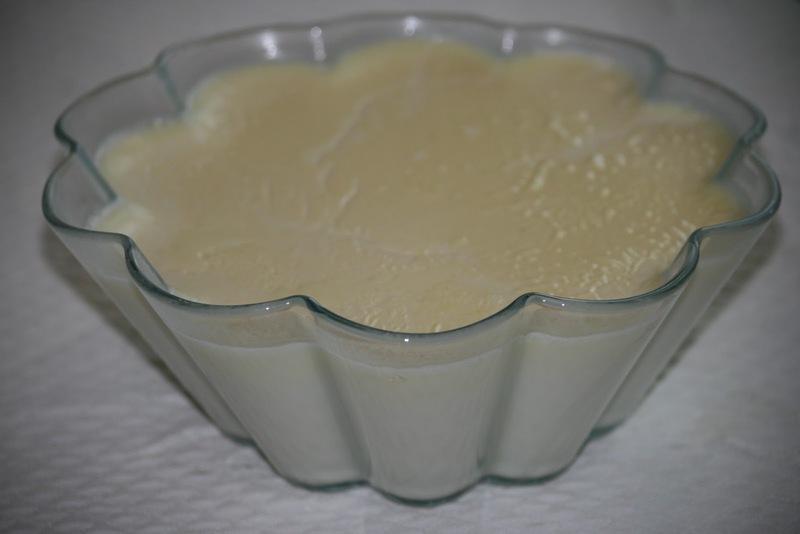 This recipe will make enough yogurt for a family for a few days- if you eat yogurt every day. Put the pots in a slightly warm oven (50°) and leave them for 8 hours. I myself put it as I went to bed and woke up the next day after my 9 hours sleep with perfectly creamy yogurt to enjoy for breakfast – Bliss! The result was a set yogurt with an incredibly creamy consistency and the cleanest taste ever. This recipe was inspired by a lengthy search on the Internet and specifically by conversations going on the lovely illustrated site tambouille.fr.